“The Other Bin Of Scrooge McDuck!” has maybe one of the worst intros the show has done so far. DuckTales has been struggling with intros for a while but a loud-whispering, exposition-filled exchange between Lena and Magica while Lena tries to cut the number one dime from Scrooge’s neck is one of the worse. I get the need to “re-cap” the narrative so far. Episodic TV, particularly kids’ cartoons, have historically needed scenes to explain past events as fast as possible to catch up new viewers and/or audiences with non-attentive attention spans. But of all the possible situations and ways to do that, they had to do it during a semi-tense moment while Scrooge was sleeping, which didn’t make sense. Lena and Magica both know they would have to be quiet. Why would you decide to do this forced talk now? "The Other Bin Of Scrooge McDuck!" That introduction is emblematic of a scattered, mostly unnecessary episode. It’s difficult to even describe it as table-setting, as only two major events occur, one of which ends up being a total copout (I’ll get to that in a bit). Both A and B-plots are pretty superficial, but even stepping away from any sense of development, they’re fairly flat, with little tension, littler character development, and even less light, comic richness. Previous episodes have done much better with developing real action, playing around with character dynamics, and/or just enjoying a fun, snappy story. 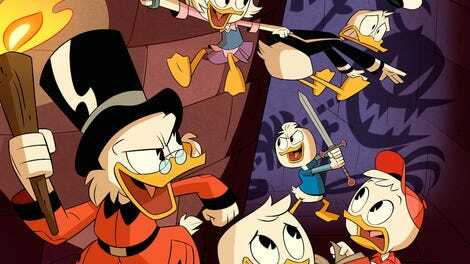 “The Other Bin oOf Scrooge McDuck!” lacks any of those episodes vision. It’s filler, and even fun filler. The sloppy introduction does expose the toxic Lena and Magica relationship more, but it doesn’t really do anything different than what we’ve seen before. It’s ugly and disturbing, and Lena is a likeable enough character that when we watch how emotionally abusive and manipulative Magica is to her, we feel for her. Still, no real change occurs in the episode, that constant push and pull between befriending and being honest with Webby versus satisfying the whims and criticisms of her controlling aunt driving the narrative but not leading anywhere for the most part. For one terrifying second, it seems that once Lena got her hand on the dime and released Magica from within, that the horrifying climax of this narrative was taking shape. Watching Magica transform Webby into her classic doll from the old show, swinging her around like a literal puppet, and then working Lena up to the point that she eradicates the doll was heart-stopping; to reveal it was all a dream (nightmare!) from a mystical dreamcatcher is such a narrative copout of the laziest kind. It does trigger Lena to the point that she’s ready to finally confess, but Magica ends up taking control of her whole body and mind. It’s messed up for sure, but comes far too late, forcing us to wait until another episode to follow up. 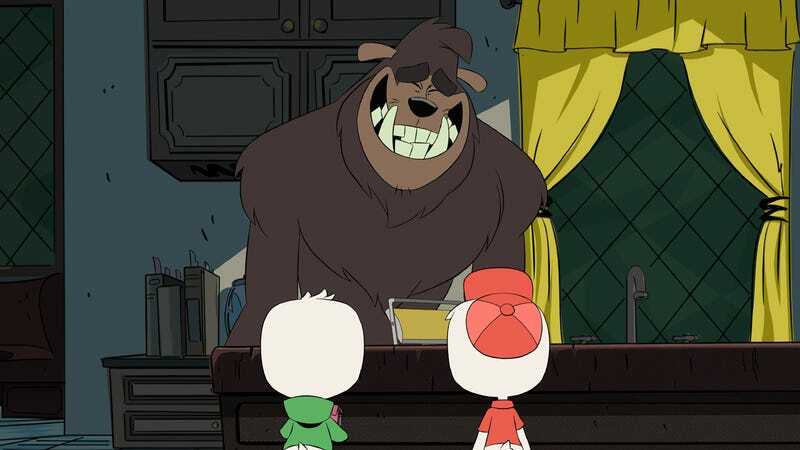 Elsewhere, the triplets get involved in a wonky tale with Bigfoot, an undercooked B-story that mostly exists to showcase how clever Louie can be. He’s by far the the writers’ favorite character, but even the satisfaction of hearing him say “I win” to a scamming Bigfoot can’t overcome the flatness and frustration of the plot overall. A lot of it is driven by Idiot Plot mechanics, Huey and Dewey feel inconsequential (and honestly, it feels like Dewey should have been the one who brought in Bigfoot, not Huey), and otherwise lacks a sense of fun or comedy that better throwaway plots can bring. There’s an overall sense that even the creative team knew this was a lesser effort (most of the promotion this week was for next week’s Sky Pirates episode), and honestly, I don’t really blame them for placing this one in a metaphorical other bin. When Louie found out Bigfoot was scamming them (with other... Bigfeet? ), the monster threatens him and his family, which is why he doesn’t say anything. I can’t help but think though, your uncle has a crossbow and is ready to throw down, and as someone who tussles with monsters on the regular, going to Scrooge for help would have been way to go. I get that they want to show Louie turn the tables on him instead, but still, at least entertain that possibility! Couple of Life and Times of Scrooge McDuck references in this episode, mainly when Webby is lecturing Lena. It’s been a while since I read it, so I wonder how accurate she was (probably very). I do like the show is using a lot more squash-and-squish and exaggerated blurs and smears to add a wacky edge to the action moments. Really makes them pop.